This 219 page, 8 1/2" by 5 1/2" book, complete with Excel® software, is comb-bound with durable, laminated covers. In an era of historically and pitifully low investment prospects for all asset classes (including stocks, bonds and real estate), this turnkey guide for you as a member of the Boomer Generation will easily provide the opportunity to create consistent double-digit income investment returns yourself in the comfort of your own home. No experience or help is necessary other than this book. The big issue for us Boomers is this: even assuming that we can step up our savings significantly for retirement, how can we generate sufficient income on investments in our retirement given the prospects for a slow-growth stock market and the low interest rate environment that may persist for many years to come? All of these major issues affecting our financial lives are now converging on our ability to retire early, or on time, or at all. The long-term prospect of low returns from both equity and fixed-income investments demands of us more than ever that we devote significant energy to planning our earnings, expenses, asset accumulation, debt creation/ elimination and investment decisions so we have a personal roadmap leading us to success, and so we can make adjustments along the way. While each of us needs a broad-based financial plan (and as the author I provide you with a means of creating one of your own that comes with this guidebook), clearly one of our greatest challenges is how we can achieve a reasonable rate of return on our investments for the long term, especially given the trends of stock market investments in recent years and the current pathetic yield on fixed income investments. 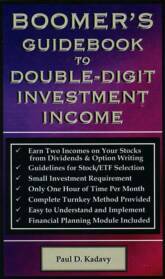 This book will narrowly focus on what is likely to be the single best opportunity to achieve consistent double-digit income returns that provide the potential to outpace other alternatives now and into the future. The strategies detailed in this guidebook are readily understood, easy to implement yourself in the convenience of your own home without further advice, and will work as a permanent program for the rest of your life. The program involves (1) the selection of high dividend paying common stocks of very large, highly recognizable companies and Exchange Traded Funds (ETFs) to provide substantial dividend income and (2) writing covered call options on the shares selected to provide a secondary source of premium income in addition to the dividends. The book details a second strategy of writing put options on such shares as an alternative to writing covered calls. Put writing can generate consistent, predictable income, but also provide an opportunity to purchase these shares at a price below current market value. Throughout my thirty-year career as a bank executive, I have successfully utilized both strategies of writing covered calls and put options myself. The fact that I used these strategies was one of the reasons I was able to retire early and continue to enjoy double-digit returns on my investments. I realize that you may not know anything about these strategies and that some of the terms mentioned here may already be totally unfamiliar to you. For now, trust that everything you need to know is in this guidebook. By the time you have finished the book, you will be very knowledgeable about the entire process…even comfortable with it. Best of all, if you want to practice option writing on paper before committing real investment dollars, you can see for yourself how it works for as long as you like until you are ready to allocate your investment dollars at the time of your choosing. The strategies outlined in this guidebook can be used equally successfully with the largest of investment portfolios or with as little as 100 shares of an Exchange Traded Fund or individual stock. The program provided in this book to assist you in achieving double-digit compounded annual returns might be more conservative or more aggressive than your current investment approaches. Suffice it to say for now that the program involves more risk than placing your money in an FDIC insured bank, but less risk than simply being invested in the stock market. If you are willing to take some risk to significantly increase your retirement income, but not as much risk as just being in the stock market alone, then this book is for you. By using the tools in this guidebook, you will have a viable means of working towards this worthwhile objective, with the side benefit of creating a lifelong financial plan if you wish to do so.